Swissport’s Damien Dirienzo has received the ‘Soldier of Service’ Award from Cebu Pacific at the airline’s International Station Managers’ Conference. The “Soldier of Service” award is described as a special recognition given to someone who showcases the characteristics of a follower, a leader, a commando of service. Swissport has supported Cebu Pacific since they launched Sydney-Manila services in 2014 and Melbourne-Manila services commenced in August this year. 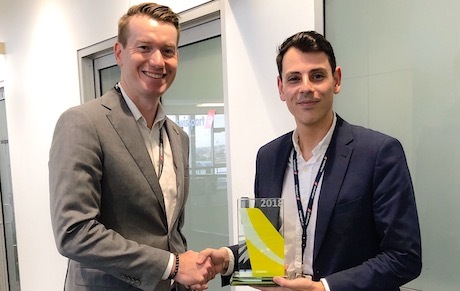 Swissport Pacific CEO Glenn Rutherford congratulated Damien on his award saying “Damien’s dedication is second to none and recognition like this from an airline partner is something to be extremely proud of”.